A smart Barnard tan leather shoe from Bowe and Bootmakers with contrast dark navy top panels detailing and laces. Lined in textile with a cushioned footbed. 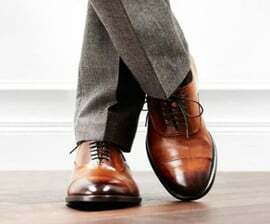 These mens dress shoes are perfect for adding style to your closet. With soft leather uppers this is a smart-looking option for any stylish outfit.